PNC-27 is a synthetically created peptide designed to specifically target and destroy cancer cells. It is a member of the PNC set of investigational proteins designed to attach to malformed (cancerous) cells and cause them to die through cell necrosis, all while leaving normal, healthy cells intact and unharmed. The PNC-27 peptide contains an HDM-2 binding domain corresponding to residues 12-26 of p53 and a transmembrane-penetrating domain. This has been found to enable the peptide to bind to and kill cancer cells through membranolysis, or disruption of the cell membrane. Through research and study on animal subjects, the PNC-27 peptide has been shown to be highly effective in selectively targeting a wide variety of specific forms of cancer, including pancreatic cancer, breast cancer, leukemia, melanoma, and additional cancer lines. How Does the PNC-27 Peptide Work? 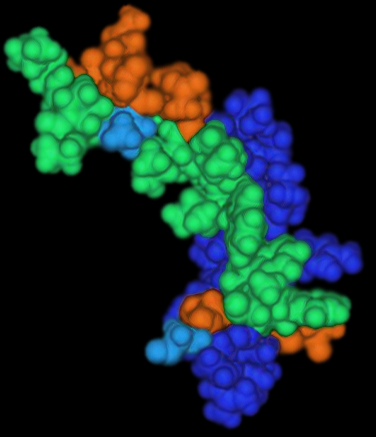 PNC proteins were first theorized and created in 2000 by Drs. Matthew Pincus and Joseph Michl at the SUNY Downstate Medical Center in New York. Although they were originally intended to combat HIV, PNC-27 showed a remarkable ability to bind to cancer cells, causing them to die, while leaving healthy cells undamaged. The PNC-27 cancer peptide is a nontoxic compound that causes the death of cancer cells only, leaving all other healthy cells unaffected. It is able to do this by attaching to the membranes of the individual cancer cells, creating holes in those membranes. As a result of the holes, rapid implosion occurs, leading to swift cell death due to the osmotic pressure difference in the inside vs. outside of the tumor cells. PNC-27 accomplishes this due to its affinity for binding to a protein called HDM-2. Cancer cells have HDM-2 in their cell membranes. When the PNC-27 peptide is administered, it immediately travels to the HDM-2 located in the membranes of cancerous cells. By binding to them, it creates pores or holes in the cell membrane, causing “membranolysis,” or death of the cell membrane. This in turn leads to the destruction of the cancer cell. In a paper published by the American Association for Cancer Research in 2010, Drs. Ehsan Sarafraz-Yazdi et al. revealed in depth how the PNC-27 cancer peptide exerted its effects and what its novel mechanism of action meant for the field of cancer research. The paper’s authors reported that the peptide’s mechanism of action is due to the formation of oligomeric pores in the plasma membrane of tumor cells. Concurrently, oligomeric pores are not formed in untransformed, or non-tumor, cells. Further, they noted that it has been shown that MDM2 as a targeting molecule leads to PNC-27 selectivity towards cancer cells by its mis-localization to cancer cell plasma membranes. Researchers concluded that these findings are descriptive of the unique localization of MDM2 variants in the plasma membranes of cancerous cells. Further, they stated that this knowledge may hint at great promise for the PNC-27 peptide as a future anti-cancer drug pending clinical trials. The PNC-27 research peptide has even been the subject of a fascinating Ted Talk. It can be seen conducted by Dr. Sarafraz-Yazdi, an Assistant Professor in the Division of Gynecologic Oncology at The State University of New York (SUNY). When the PNC-27 peptide is administered in animal studies, certain aspects have been noted in successful outcomes. Researchers have noted pain levels subjectively drop in a mean time of about a week. By the 3 week mark, animal subjects often present with flu-like symptoms, a likely indicator that subjects’ immune systems are responding to the death of cancer cells. At 6 weeks, lactate dehydrogenase and bilirubin levels typically increase. Substantial tumor breakdown in successful research outcomes is often observed at around the 10 week mark. At this time, the tumors are noted to become softer and more pliable. Some increase in the size of the tumor itself may be noted at this time. However, this is often due to inflammation because of immune system response. By the end of 3 months, researchers often notice animal study subjects to exhibit increased energy levels and reduced cancer-related symptoms. PNC-27 side effects have been observed in animal studies. These have included skin and nose inflammation, watery eyes, dry skin, high blood pressure, headache, back pain, nosebleed, rectal bleeding, taste change, and too much protein in the urine. In a 2009 study, researchers found that the previously established 3 dimensional structure of PNC-27’s p53 residues was directly superimposable on the structure for the same residues bound to HDM-2. This led the researchers to infer that PNC-27 could target HDM-2 in cancer cells’ membranes. Notably, cancer cells have significant levels of HDM-2 in their membranes, while untransformed or noncancerous cells do not have significant levels of HDM-2. This allows the PNC-27 peptide to selectively target the cancerous cells, leaving undamaged the healthy surrounding tissue. Upon further experimentation, it was discovered that by implanting untransformed cells not susceptible to PNC-27 with HDM-2 containing a membrane localization signal, these cells then became susceptible to PNC-27. As a result, this constituted further evidence that the PNC-27 peptide was able to selectively target HDM-2 in the membranes of cancer cells and destroy them via membranolysis, all while leaving healthy cells unharmed. Further, in a 2010 study published in Cancer Chemotherapy and Pharmacology, researchers determined that PNC-27 exerts its cancer cell destroying effects as a whole peptide, not fragments. With the knowledge that the peptide forms transmembrane pores in the cancer cell membrane, researchers set out to determine whether these pores were created by parts of the peptide (fragments) or by the entire peptide itself. During the experiment, it was shown that it was indeed the entire peptide that exerts its effects in the cell membrane of cancer cells. Further, it was observed that other nontransformed, or noncancerous, cells around the cancer cells “remained viable.” From the results of the experiment, researchers gleaned that the PNC-27 cancer peptide targeted specific markers in the membranes of cancer cells. Also, via this mechanism of action, PNC-27’s lifetime is increased. In a 2006 study published in the International Journal of Cancer, researchers found that PNC-28, a forerunner to the PNC-27 peptide very similar in its structure and effects, was able to selectively inhibit pancreatic cancer cell growth in vivo. Study observers noted that the peptide induced necrosis, but not apoptosis, in a variety of tumor cell lines, including ras-transformed rat acinar pancreatic carcinoma cell line known as BMRPA1. In addition, the peptide had no effect on untransformed (normal) cells. As a result, researchers looked to determine if the cancer killing peptide could block the growth of pancreatic cancer cells in vivo. Amazingly, researchers observed that when the cancer killing peptide was administered, it caused a complete blockade of any tumor growth during its 2-week period of administration and 2 weeks post-treatment. This was followed by weak tumor growth that plateaued at low tumor sizes compared with tumor growth in the presence of a control peptide. Further, when the cancer killing peptide PNC-27 was administered after tumor growth had occurred at a remote site from the tumor, a decrease in tumor size followed by a slow increase in tumor growth that was “significantly slower than growth in the presence of control peptide” was observed to occur. Consequently, the study researchers concluded that the cancer killing peptide may be effective in treating cancer, especially if it was administered directly to the tumor itself. Essentially, researchers built on knowledge gained from earlier experimentation that the PNC-27 peptide was able to destroy solid tissue tumor cells by binding to HDM-2 proteins in their cell membranes, an effect independent of p53 activity in those cells. The scientists sought to determine whether PNC-27 peptide would be similarly effective against non-solid tissue tumor cells. This experiment would determine whether such non-solid tissue tumor cells actually expressed HDM-2 in their membranes in the first place (as the solid tissue cells were found to), and find whether PNC-27 could induce cell death in these cells through the same HDM-2 binding mechanism. Incredibly, it was observed that these non-solid tumor cells do express HDM-2 in cell membranes. Also, perhaps even more importantly, it was found that the PNC-27 peptide could induce cell necrosis through membranolysis via the same HDM-2 binding mechanism as in solid tissue tumor cells, independent of the p53 pathway.